To receive the Frost & Sullivan Company of the Year Award requires a market participant to demonstrate excellence in growth, innovation, and leadership. This kind of excellence typically translates into superior performance in three key areas: demand generation, brand development, and competitive positioning. These areas serve as the foundation of a company’s future success and prepare it to deliver on the two criteria that define the Company of the Year Award (Visionary Innovation & Performance and Customer Impact). Rescue Lens is a solution aimed at “seeing the problem”, and “solving the problem.” It does this by bringing the power of live interactive video to the support center. It also merges real-time video with proprietary Smart Whiteboard technology, giving clients the ability to support any object or device anywhere, regardless if that object is web-enabled or not. LogMeIn Rescue uses an intuitive interface for supporting mobile platforms, helping agents to quickly identify problems, click a fix for fast resolution, and escalate sessions if necessary. 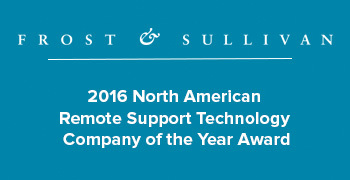 Frost & Sullivan notes that this solution has powerful applications in the realm of technical support, for instance. Download the PDF to see how the recent Rescue & Rescue Lens innovations brought LogMeIn to the lead against the competition!